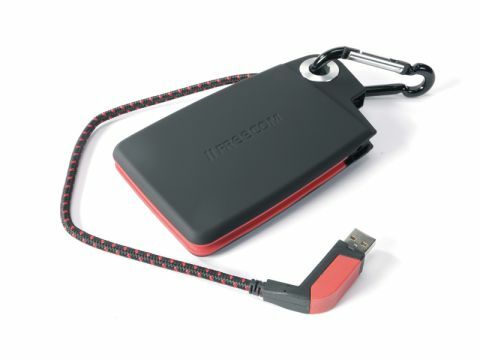 Aside from the ridiculous outdoor sports styling, the USB-powered ToughDrive Sport is an intelligent piece of design; you just need to look past the fact that Freecom seems to be suggesting it's a climbing accessory. For example, the built-in rope-styled USB lead clips neatly away and is attached to the drive, so theoretically you can't lose it, and the drive is small enough to fit in an overcoat pocket. Alternatively, you can clip it on to your rucksack using the provided carabina. The device also features a built-in 256-bit password that should keep your data safe if somebody nabs it. Despite subjecting the ToughDrive to numerous 2m drops, kicking it around vigorously in a rucksack and letting a toddler do his best to destroy it, there was no data corruption on our test files. We also dropped it mid-way through saving a large file with no ill effects. As a portable durable data drive, then, it's one of the best at its price point. Just don't bother taking it up Kilimanjaro.